Britain’s Steve Cummings has won the third stage of the 2011 Tour of the Algarve in Portugal and taken the overall lead in the race. The Sky rider from the Wirral beat Tejay Van Garderen (HTC-Highroad) and defending 2010 winner Alberto Contador (Saxo Bank) to the line after being part of an attack group on the Alto do Malhao climb. Cummings now leads Contador in the overall classificaton by six seconds with two stages of the UCI 2.1-ranked race left, including the final 17.2km time trial on Sunday, February 20. 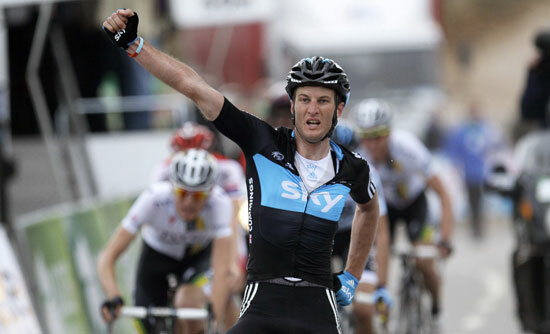 Cummings’ victory is the third international win for a British Team Sky rider after Ben Swift won two stages of the Tour Down Under in January. Contador is making his first racing appearance in Saxo Bank colours after being cleared by the Spanish Cycling Federation of doping with clenbuterol after he tested positive for the banned substance during the 2010 Tour de France.